Several eye diseases affect the retina and cause disruption to the delicate tissues and photoreceptor cells. This causes a loss of sharpness of vision. As the disease progresses, a large central blind spot can develop, or vision can become patchy or be lost altogether. Several diseases, such as age-related macular degeneration, retinal vein occlusion and diabetic retinopathy cause swelling and fluid build up in the retina, which restricts blood flow. As the tissues get short of oxygen, this stimulates the release of various growth factors that stimulate new blood vessels. Unfortunately, this only makes the problem worse. The process of angiogenesis causes new blood vessels to sprout randomly in a frantic effort to supply the retina with oxygen. They push through the retina, into the iris and into the vitreous humour, the fluid in the centre of the eyeball, causing more damage and bleeding. The laser eye surgery used to try to stop the overgrowth of new blood vessels acts right at the back of the eye. 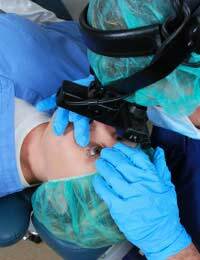 The procedure is a relatively minor operation and often does not require an overnight stay in hospital but it can help prevent blindness. The surgeon uses the a laser to seal off the new blood vessels, which are visualised by various different imaging techniques. Angiography is one of the most useful; this takes a series of photographs of the back of the eye as the person having the examination is injected with a fluorescent dye. As the dye moves through the blood vessels of the eye, the time lapse photograph shows exactly where the different sized blood vessels are and reveals areas where new blood vessels are growing. These can then be targeted during laser surgery. Age-related macular degeneration is a common cause of loss of sight in older people. The wet form of AMD involves the overgrowth of blood vessels through the retina, usually in the region of the macula. This central region of the retina gives us fine focus and visual acuity. Once the macula is damaged, eyesight worsens dramatically. Laser surgery can be used to try to halt the growth of new blood vessels but, for various reasons, it is only suitable for about 15% of people with AMD. Delays in diagnosis or treatment schedules also often mean that the surgery cannot prevent blindness. Too much sight has been lost and the blood vessels are too out of control. The lucky few who have the treatment in time are given either focal laser photocoagulation or photodynamic therapy. In this type of surgery, a dye that can be activated by light is injected into a vein so that it passes through all of the blood vessels in the body, including the new and unwanted ones at the back of the eye. When the eye surgeon uses a red laser on those blood vessels, the dye becomes active and seals off the blood vessels, leaving those untouched by the laser intact. Laser surgery involving photocoagulation to seal off the newly sprouting blood vessels is one of the few treatments available for retinal vein occlusion. The laser surgery techniques used do have some success in slowing down loss of vision but, as in AMD, only if they are used early enough in the disease. Diabetic retinopathy, the damage that can affect the retina of people with diabetes, is the leading cause of blindness in adults in the UK. Large clinical trials have shown that some people with early changes in the retina benefit from focal laser photocoagulation. This uses lasers to block the swelling that can occur in the retina at any stage after someone has been diagnosed with diabetes. In this case, laser treatment is done to protect the retina before abnormal blood vessel growth can begin. Laser surgery is also used in people with diabetes who start to show more advanced retinal disease with abnormal blood vessel growth that is in danger of causing more swelling, bleeding and vision loss. In this type of more advanced retinopathy, a technique called pan retinal laser photocoagulation is commonly used to try to stave of vision loss and blindness as long as possible.